HAVE YOU GOT REALLY BIG WHEELS? CAN'T GET A CLUTCH WORKING? Sure, big wheels can look great, and most of all give fantastic ground clearance - allowing the use of your vehicle off-road, on the beach or in boggy and bumpy terrain. Normally the first thing our clients think of when designing an off-road vehicle is how much ground clearance they can achieve. This isn't a bad thing - ground clearance is fantastic for the most part, but it all falls apart when searching for compatible gearing on a stationary engine. Typically, most stationary engines will have a 3/4" or even a 1" crankshaft - in the case of 9hp and larger engines which are commonly used on off-road recreational vehicles. However, this does come at the cost of diminishing value, since as the engine revs build, the torque converter shifts to a longer ratio meaning at 3500rpm on a typical stationary engine, if your engine is actually strong enough to get there, it will take a long time and you'll be going so fast it would be downright dangerous . What will happen in most cases is that the belt willl wear and slip, ending in a smokey and stringy or broken belt, and a significant loss of fun-time. Don't worry though, there is a way to solve the issue. 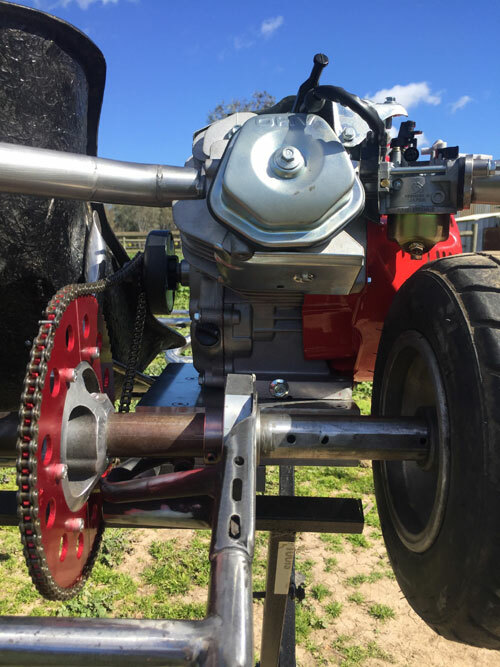 With our new range of reduction jackshaft kits you can now shorten your ratio again by 2:1, allowing you to take advantage of increased acceleration witout compromising top end speed (since you wouldn't actually achieve anything like a top speed anyway otherwise). 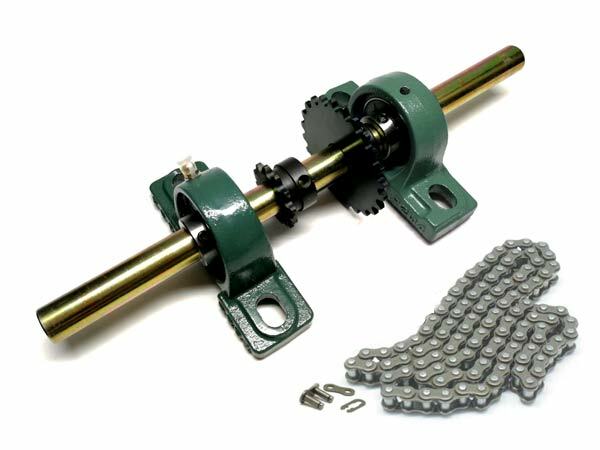 The reduction jackshaft kit is avialable in #35 and 420P pitches so that it will connect to most projects running mainstream kart chain. The reduction jackshaft kit will change a typical 3:1 reduction on a torque converter, to a starting reduction of 6:1 providing you with strong acceleration with very large wheels. The final drive ratio will be reduced by 2:1, giving you good acceleration all the way to top speed, and a top speed that is actually usable and reachable. By combining one of these incredible 2:1 reduction jackshafts along with a suitable torque converter from our range you'll be able to achieve a ratio that will allow you to use a sprocket between 1/3 and 1/2 the size of your rear wheels reliably!